Bit of a quiet week this week with only 37 miles under the belt. It did incorporate a Eureka Cafe stop and four bike shops. Cleaned the dirty Toy before I set out only to get it dirty again within a couple of hundred yards. Sunny on the way out with a bit of a chill in the air it was another trip for the Shimano MW80 mountainbike boots. I’m really impressed with these as the battle with cold is about 50% won with warm feet and these stay warm all day with no overshoes. Got home to read a good review of them in Cycle, the CTC magazine which was waiting for me when I got in. Once sated with a Eureka breakfast and the banter you only get at the Eureka it was time to head out for the purpose of the ride, a Mavic spoke holding tool. Took the Dee cycle path which was really quiet. One of the sights you get see which is unique is an A380 Airbus wing about to make it’s way by barge to Toulouse. No barge today but the loading is a sight worth seeing. Once at Chester it was a trip around the Racecourse. I’d say this was one of Chester,s cycling secrets. It brings you out below the Courts and The Groves. First up was the EdgeCycleworks, some nice Treks in there with Endura clothing. None of the highend stuff which is probably a good thing. Next up was Maplins for an Edge cadence sensor battery. £3.49 was a bit steep I thought. Bike Factory next where the Mavic spoke holder was ordered. Caters for all abilities but there is some top end kit from Trek and Pinnarello. Next up was the Specialised Concept store, Grahame Cummings invited me to bring the Toy inside(I liked that). Some nice kit including a Specialised Shiv that looks like it breaks the UCI 3:1 rule. Might end up taking one of the demo bikes out at one stage to see if the zerts inserts in the seatstays work. Next up was Keith at Eureka Cycle Sports. Here the new opening times for the Eureka were confirmed. From next week the Eureka is open on a Thursday and a Friday, use it or lose it. I also got around to explaining about Twitter and 4Square. Twitter can work really well for a cafe or restaurant as I follow a few Wirral ones. There’s the rub most of us are walking in with Smartphones and Satnavs, the Garmin bleep is quite distinctive at the Eureka. A bit like this site you need to stay with the times. Ride home was a bit bleak as narrow roads mean traffic can’t pass you cleanly and even on the dual carriageways traffic bunched due to the traffic lights. Once off it you are fine. Next stop was Willaston for a Lucozade Sport as I’ve spent too much time yapping in bikeshops. Perusing the post cards in the Post Office window was one offering brazilians and other topiary. Where’s this leading you may ask.Well I’ve finally secumbed to some of the fake replica kit from Hong Kong. Lycra doesn’t last forever even if it does have a Nike logo on it. No one is ever going to tell you your shorts are semi transparent in a certain light. That should be the back row of the spinning class spared but just as easily applies to a club ride. Thinking about it, at least in a spinning class you can look the other way, on someones wheel your pretty much stuck with the view. The shorts seem well made with a coolmax pad that seems a step up from the cheapest versions. Most of the top teams seem to have been copied with options of winter kit which in it’s original form is hard to get hold of or for team use only. Had the battery fail on the laptop with two 18650 cells going down. These are the same cells used by the MagicShine bikelight so I’ve ordered 4 from Dealextreme to be made into a new battery pack. A pattern battery for the laptop cost £50 from a UK supplier. The battery failure is not a good sign for all those new electric cars coming onto the market as it’s useing the same technology. 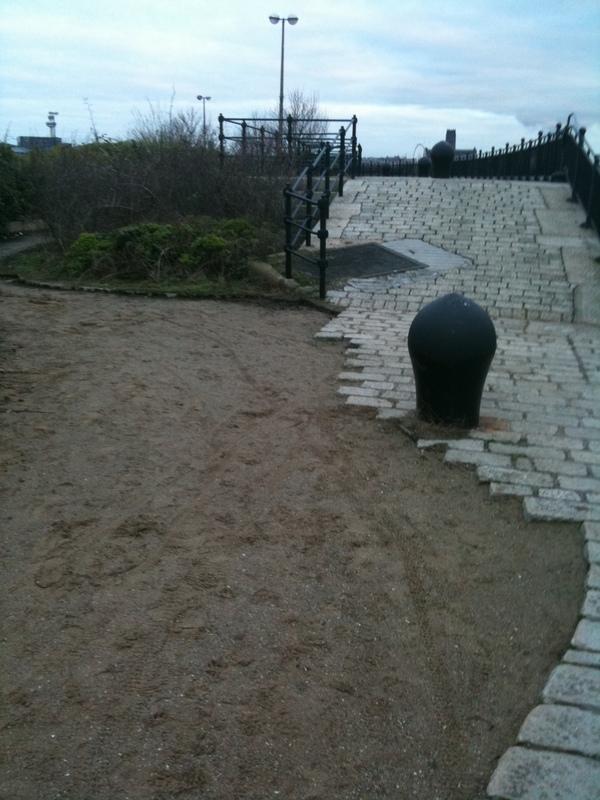 Thought I’d add a bigger picture of the missing cobbles near the One O’clock Gun. Thursday: Spinning class at the Oval followed by a trip to Birkenhead . I thought I’d overpaid for the cadence sensor battery as I picked a card of eight up in a £1 shop. Mind you I wouldn’t leave a £3K bike outside. Managed to get Keith signed up for FourSquare in the afternoon with the Eureka to follow soon. Twitter is on the cards too. One advantage is your probably going to know what the soup is going to be on a given day. Good news about Eureka, Frank. (any cafe), it’s annoying hearing them hunting for a satellite fix inside a building so they detect movement (bleep) then realise they’re stationary (bleep) and all the while the stats are getting thrown out (average speed). The good news Dave is that an Edge 800 will auto power down. The bad news, movement detected is a double edged sword you could press stop and still have it bleeping at you thinking you had resumed a ride without pressing Start. That’s a hell of a bike establishment itinerary Frank! I’m officially jealous! What’s the sizing like on the replica kit? I’ve always been put off ordering any in case it’s the wrong size for me. Not sure what you mean, Frank. In my experience hitting ‘stop’ prevents any beepage until I hit start. Mark, it’s about a size up on the Nike sizing. The sizing was published on the ebay shop. Just go into it with open eyes knowing it is not the real deal. Clive, it’s a hard life looking at all those bling bikes. Eureka is now on Twitter – @eureka_cafe I picked up their first tweet as I have a keyword search running in the background on Tweetdeck and just happened to catch their ‘hello world’ first message withing seconds! Dave, word of mouth doesn’t cut it anymore. I see you’ve got Chris Boardman in on it so they should get off to a good start. I’d guess over 50% of us are using a smartphone and or GPS, the only ones likely to miss out are probably drawing a pension, don’t have a computer or an email address. Definitely right there Frank – no easy to look the other way when sat behind someone for miles and their shorts are wearing thin! There have been a couple of offenders on the Friday ride I do recently!